My everyday makeup look is more on the natural side. My favorites are lipgloss, and I stay within the nudes and browns family. My go to eyeshadow look is always a black smokey eye, and I opt for a smokey eye on special occasions. I like the less is more approach when it comes to makeup. My makeup collection is a mixture of drugstore and department store favorites. I have been using the same foundation for years as it's difficult for me to find shades that match my skin tone because my skin tone is neutral. (My skin tone is a mixture of warm and cool, and most of the time it's difficult to get a shade that fits me correctly). Let's dive into my makeup bag and see what we have in there. I have used Revlon Colorstay in Cappuccino for years. It is one of the foundations that work well for my skin tone. My second favorite foundation that works well for my skin tone is Becca's Ultimate Coverage Complexion Creme in Mink. I use both foundations interchangeably. 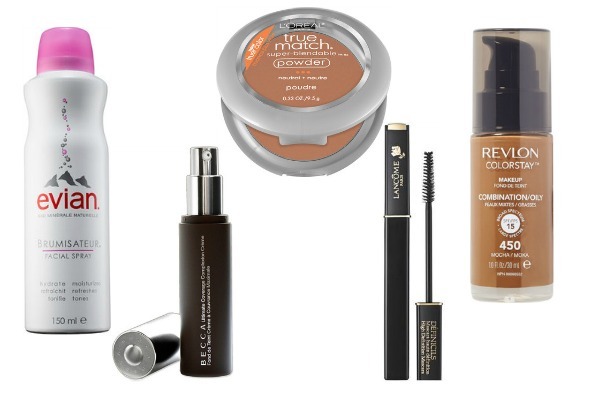 The Revlon foundation is light in consistency while the Becca foundation is heavier in texture. I reach for the Revlon foundation in the Summer and reach for the Becca foundation in the Winter. I use Mary Kay Concealer in Bronze 2 to cover the dark circles under my eyes and dark spots/blemishes. I use Maybelline Concealer in 30 Cafe to highlight my face. I use my M.A.C prep and prime in Transparent to set my highlight. I use Lancome Definicils Mascara. I apply 3-4 coats of mascara on each eyelash to give me the volume and length that I desire. I don't wear false lashes, but sometimes I will use my fiber mascara for those special occasions. My eyebrow pencil is in dark brown from Nicka K and to line my eyes; I use my Wet and Wild eye pencil. My current favorite lipglosses are from Black Radiance. I finish off my makeup with my setting powder from L'oreal, their True Match Super Blendable Powder in N8. My absolute favorite setting spray is the Evian Facial Spray. It moisturizes and tones and refreshes my skin. I love how versatile the Evian spray is; I sometimes use the spray to mix up my foundation before applying, or I use it as a setting spray after my makeup has been applied. After applying my makeup, I hold the can twelve inches from my face and spray the mist over my makeup and the mist evens out my complexion and creates the natural look which I love. Evian Facial Spray comes in three sizes. 1.7 oz which is a travel size and ideal for your gym bag or purse, 5 oz which is perfect for the office and 10 oz which is perfect for the home. This post is in collaboration with Evian, all thoughts and opinions are my own. I also like using the Evian Facial Spray as a setting spray to make my matte foundation looking a bit more dewy. Before you apply your make up you should use a moisturizing cream to so that it can form a smooth, even surface over your skin and will help you while applying the make up evenly. Cetaphil is good for all kinds of skin types and will not have any side effects or allergies in the future. Wow I have not tried a facial spray before, this sounds interesting. And I am always trying out new things, have not stuck to the same thing for while now hahaha.